For this month’s bread bakers the theme given was overnight breakfast bread. 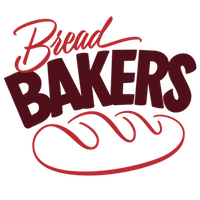 When I was using dry yeast for baking bread, I always make the dough the previous day and let it for overnight rise and then bake the next day. After started using instant yeast, I was not proofing overnight. But for this month’s theme I did so. 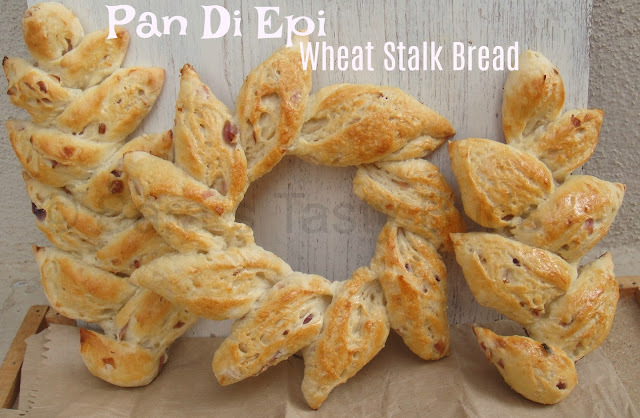 As the Christmas mood has set in everywhere , I thought of baking a bread related to Christmas. Though we won’t celebrate Christmas , we enjoyed this bread. The main ingredients needed for this sticky bun are brown sugar and melted butter. I added glazed fruit pieces ( Tutti – Frooti ) to this bun. I thought of adding glazed cherry , as it was raining heavily I couldn’t go out. So I used what was in our pantry. In a large bowl , combine the flour , sugar , dry milk powder and yeast well. Make a well in the center and add the warm water and salt. With laddle combine all the contents together. Knead the dough for 10 minutes or till the dough passes the window pan test. Transfer the dough to the oiled bowl , cover with a kitchen towel and let it raise for 1 – 2 hour. Lightly grease the 18 cm ring pan or bundt pan. 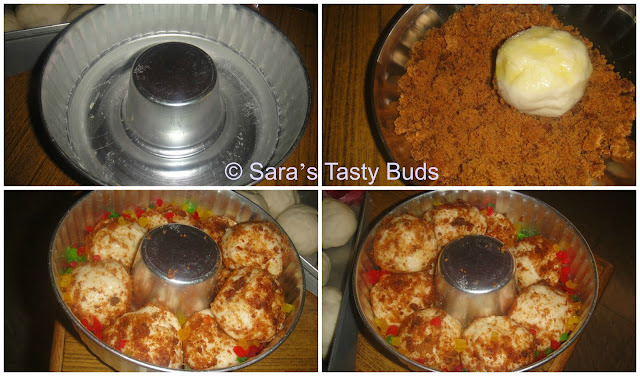 Punch the dough and shape into one inch balls. Dip each dough ball in the melted butter and roll in the brown sugar. Place the prepared dough balls on the greased pan. In between sprinkle the glazed fruit pieces. Arrange all the dough balls in layer and pour the remaining butter and brown sugar on top. Let it raise for 45 minutes and bake . I refrigerated the raised sticky buns by covering with cling wrap overnight. Take the pan out off the refrigerator 30 minutes before baking in the Christmas morning. Preheat the oven to 180*C and bake the sticky buns for 25 – 30 minutes. Christmas morning sticky buns are ready to be served as breakfast on the Christmas eve. I love the way you arranged this sticky bun. Beautiful! These overnight sticky buns look absolutely fabulous! Would be a great treat for the next sleepover my kids have! 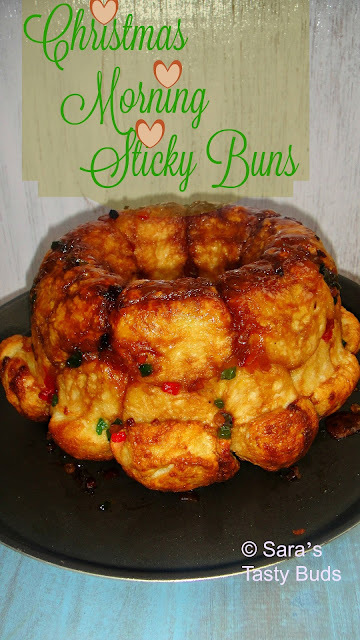 My mom always shared a pull apart cinnamon sticky bun creation on Christmas mornings. Your post brings back those happy memories! 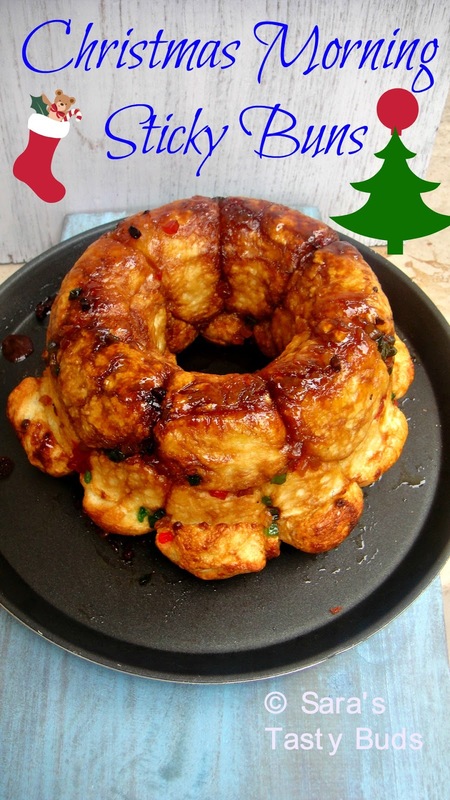 Sharanya kids would absolutely love these Sticky buns on Christmas morning! Fabulous!! Who would not want to grab one of these sticky buns the minute they could? The best part? Licking off your fingers. Beautiful buns Sharanya!! Simple yet exotic and so perfect for the season! Beautiful sticky buns. They look really tasty, and the pan is perfect for them! I would love to wake up knowing that this was my breakfast! Festive looking sticky buns Sharanya. Looks perfect for this holiday season.